"At its core, pan-Arabism was a repercussion of colonialism, an ideology mobilised as a rejection of a hegemonic and homogenising Western universalism, deployed in resistance to the onslaught of modernity and its non-Arab associations... The biennial was therefore the local manifestation of this global vision – one that involved an attempt to reimagine and redefine the world, but one that could only be fulfilled by first tending to the pan-Arab project." My paper on the genesis, ambitions, and paradoxes of the first regional biennial in the Arab world is now out -- after seven years of writing the first draft! In 1974, the First Biennale of Arab Art was inaugurated in Baghdad, envisioning a radical nomadic exhibitionary model that preceded the European equivalent, Manifesta, by two decades. The ostensible aim was to celebrate regional artistic virtuosity, and provide opportunities for evaluating and disseminating Arab art. 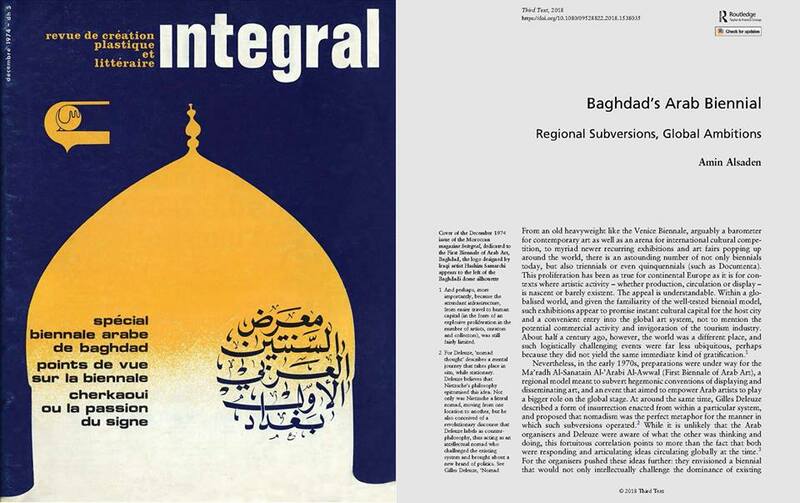 By examining disputable claims to the event’s genesis and Ba’thist politics at the time, however, and by situating it within contemporaneous global currents, including oil embargos and Cold War alliances, this article argues that Iraq instrumentalised the biennial towards tightening control locally and asserting its position as the centre of the Arab world. While the regime’s manipulations ultimately compromised the initiative, the collective project signaled an exemplary moment of regional confluence and exchange, thus challenging hegemonic conventions and networks that often excluded Arab artists. Most importantly, the article argues that the biennial was motivated by global ambitions around which both the regime and Arab artists converged.